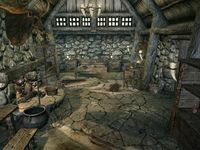 Center of Falkreath, behind the inn Dead Man's Drink. 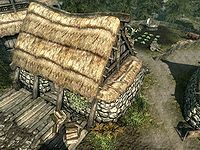 Corpselight Farm is a small farmstead located in Falkreath. It is run by Mathies and his wife, Indara Caerellia. Their daughter was recently killed when a passing farmhand named Sinding went berserk and ripped her to shreds with his bare hands. When first visiting Falkreath her parents can be found at the burial service being held in the graveyard beyond the rear of their plot. It consists of only one interior zone, Corpselight Farm. There is a small farm plot behind it with the plants and livestock listed below. There is a cart filled with six cabbages and a grain mill at the rear of the house, as part of the farm plot. This single room home, with a cupboard holding a potion of minor healing, a bottle of wine and a bottle of alto wine. To the right, in the southern corner and along the southwest wall are several barrels of foodstuffs. Opposite the cupboard on the northwest wall is a long wooden table and bench. On the table are two bottles of alto wine, a bottle of wine, a portion of grilled leeks, three chicken's eggs, a baked potato, a raw rabbit leg, several loaves of bread, a seared slaughterfish, a salmon steak and various pieces of cheese. Hanging above from the ceiling are four pheasants, four rabbits, two salmon, two garlic braids, a bunch of frost mirriam and a bunch of elves ear. Opposite the door in the middle of the northwest wall is a fireplace with a cooking pot in front and a bowl of Troll Fat on the mantelpiece. By the hearth is a pile of firewood and woodcutter's axe. To the right of the fireplace is a cupboard holding two common books, a copy of The Apprentice's Assistant and a copy of the Restoration skill book Racial Phylogeny. Above the cupboard are two more bunches of frost mirriam and three more bunches of elves ear. Coming out from the northeast wall is a large double bed with end tables either side holding a bottle of wine and one of alto wine. Next to the bed on the southeast wall is an unlocked chest containing minor loot, with a round wooden table and two chairs to the right of the chest. On the table are a bottle of each; wine and alto wine and a loaf of bread. Right next to the entrance is a basket containing three more chicken's eggs. The grain mill can be used to produce flourHF from wheat if Hearthfire is installed.